Timothy B. Yoo Attorney Profile | Bird, Marella, Boxer, Wolpert, Nessim, Drooks, Lincenberg & Rhow, P.C. Timothy B. Yoo specializes in technology and intellectual property disputes. Timothy has rapidly become a go-to trial counsel for helping companies resolve their most complex commercial matters involving patents, trademarks, digital media and design copyrights, and trade secrets. 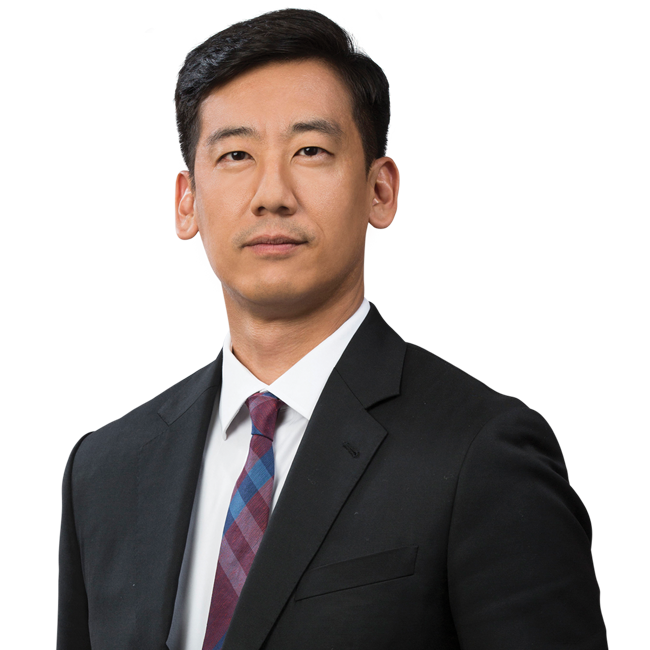 In 2016, he was named one of the “Top 40 Under 40” lawyers in California by the Daily Journal, and in 2018, he was recognized by Benchmark Litigation on its “Under 40 Hot List” of top attorneys in the U.S.
Fluent in Korean, Timothy co-heads Bird Marella’s Korea Practice and is a member of the firm’s Entertainment Practice Group, where he specializes in advising entertainment and technology companies on defending and asserting their intellectual property rights in the US. He also advises domestic and multinational companies on all aspects of commercial and business disputes, including trials and appeals in state and federal courts. As co-lead trial counsel, achieved a complete defense verdict on behalf of his client SK Hynix, one of the world’s largest chip manufacturers, after a three-week jury trial in the Western District of Washington in a $175-million breach-of-contract lawsuit brought on behalf of the Microsoft Corporation by its subsidiary insurer. Cypress Insurance Co. v. SK Hynix America, Inc., Case No. 2:17-cv-00467-RAJ (W.D. Wash.). Led a team that successfully defended a $50-million copyright-infringement lawsuit on behalf of his client CJ Entertainment & Media concerning the distribution of “K-pop” songs in the U.S. over the Beats Music platform. Prior to the commencement of extensive international discovery, Timothy was able to get the case dismissed in its entirety based on the doctrine of forum non conveniens, which the Ninth Circuit has noted is an “exceptional” remedy that is rarely to be used. DFSB Kollective Co. Ltd. v. CJ E&M, Inc., et al., Case No. 2:15-cv-01650-SVW-FFM (C.D. Cal.). Favorably resolved a global trademark dispute on behalf of his snack-food manufacturer client World Peas Brand, the maker of Peatos™, against the Frito-Lay company. Obtained a Right to Attach order on behalf of his client Galaxia Electronics Co., Ltd., an LED-display manufacturer in a $16-million breach-of-contract case pending in the U.S. District Court for the Central District of California. Timothy successfully petitioned the court for a Right to Attach order, which entitles Galaxia to the extraordinary pre-judgment remedy of obtaining writs of attachment over defendants’ properties, after demonstrating that it was “more likely than not” that Galaxia would obtain a monetary judgment in an amount certain against those defendants. Galaxia Electronics Co., Ltd. v. Luxmax, U.S.A., et al., Case No. 2:16-cv-05144-JAK-GJS (C.D. Cal.). Represented a California financial institution against claims of securities fraud and alleged damages exceeding $25 million. Plaintiff was the largest shareholder and former Chairman of the Board for the institution. After cross-examination of Plaintiff and certain rulings by the trial judge, Plaintiff agreed to have judgment entered in favor of client, ending five years of litigation. Successfully defended one of the largest American fashion retailers in a design copyright infringement lawsuit, obtaining a dismissal with prejudice before the close of fact discovery. Represented large wireless device manufacturer in a patent infringement investigation before the International Trade Commission, resulting in a determination of non-infringement and invalidity of the asserted patent. Represented Intel in a patent litigation matter in the District of Delaware, resulting in a stipulation and final judgment of non-infringement following claim construction, which was later affirmed on appeal. Represented defense subcontractor in a theft of trade secrets and Lanham Act Section 43 trade dress/unfair competition action in the Central District of California, resulting in a favorable settlement for the client.